The guitarist plays an eclectic mix of folk, blues, hard rock, country, jazz and reggae. Growing up in a musical family, he quickly developed his craft as a singer-songwriter and guitarist, played his first gig at the age of 12 and by his early 20s performed live with iconic bluesman Taj Mahal. 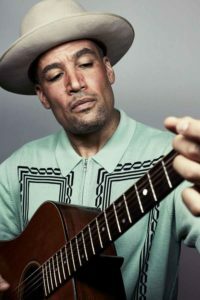 Beginning with his 1994 debut, Welcome To The Cruel World, Ben Harper released a string of eight studio albums over a decade and a half. This extraordinary run, featuring contributions from the Innocent Criminals, established him as a singularly powerful songwriter and performer with range across multiple genres and an unmatched ability to blend the personal and political.